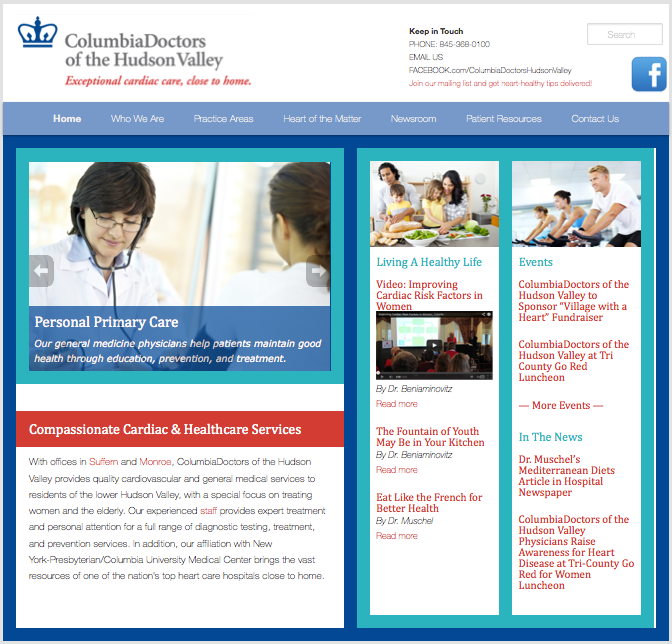 ColumbiaDoctors of the Hudson Valley, a growing cardiology practice in Rockland County, needed a brand new website when they became affiliated with the prestigious Columbia University Medical Center. But there were challenges. First was the name. Having already been through three name changes, there was some confusion about the practice. With their new affiliation, was the practice still local? Would patients have to go to New York City for treatment? Feedback from staff interviews identified that travel was indeed a perceived issue for many patients. So we essentially reversed the commute. While treatment in Manhattan was certainly an option, we positioned the practice as providing the resources of a leading heart care hospital close to home. In fact, we made it part of their tagline. A second challenge was letting patients know of the wide-range of treatments available without overwhelming them with medical terms. Simple, brief explanations for medical terms were provided by pop-ups that appeared when the cursor was placed over the text. And to put a face with a name, we included personal profiles, photos and quotes from the doctors themselves. MarketingWorks has also written a number of local advertising campaigns for the practice.